Where's Super Mario when you need him? For some reason, gamers want to see Washington, D.C., destroyed. Last year it was Fallout 3 that reveled in the ruins of the District. Back in June we showed you a video game called The Conduit, which gave you a gun and pointed you in the direction of the Metro system to kill as many aliens as you could (and blow up a few Metro stations along the way). Last week the History Channel even blew up D.C. with a nuclear bomb. And just last night during Sunday Night Football on NBC, viewers were treated to even more D.C. destruction, this time in the premiere of the trailer for Call of Duty: Modern Warfare 2. 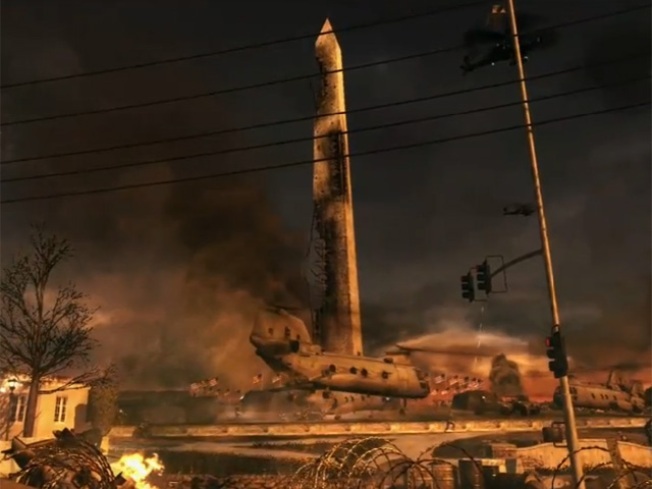 After gamers only saw fighting on foreign soil in previous trailers, this time the ad showed fighting on the National Mall, complete with a partially destroyed Washington Monument and an enemy-occupied White House. "The world has been your battlefield, everywhere you go, the blood of brothers and sons screams out against you. Perhaps you cannot yet hear it, because the soil is not your own. But you will." We love the graphics and the music in the trailer, leading us to believe this will be an excellent game when released Nov. 10. But we have to ask: What's with all the ill-will toward D.C.? What's it going to take to get a kinder, gentler D.C.-based video game? How about a Zoo Tycoon at the National Zoo? Raise your own Tai Shan! Heck, we'll even take a Super Mario Kart on the Beltway at this point. So go pick on Philly for a while if need be. Just stop blowing up our fine city.